Aw Saunts' Day (an aa kent as Aw Hallows, Solemnity o Aw Saunts or The Feast o Aw Saunts) is a solemnity celebratit on 1 November bi the Catholic Kirk, an on the first Sunday efter Pentecost in Eastren Catholicism, in honour o aw the saunts, kent an unkent. ↑ Marty, Martin E. (2007). Lutheran questions, Lutheran answers : exploring Christian faith. Minneapolis: Augsburg Fortress. p. 127. ISBN 978-0-8066-5350-1. Retrieved 2 November 2011. 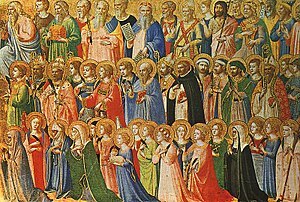 All Lutherans celebrate All Saints Day, and many sing, "For all the saints, who from their labors rest. . ."